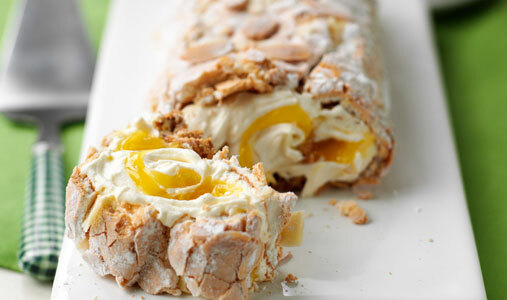 Tuck into a delicious low calorie dessert tonight with our Fruity roulade. Ready in 30 minutes for 67p per serving, it makes a fantastic centre piece for the table! 1. Heat oven to 200C/gas 6. Grease and line a 30 x 24cm Swiss roll tin with nonstick paper. Put the eggs and sugar into a large bowl and beat until thick and light. Fold in the flour and baking powder, then the vanilla. Tip into the tin, tilt to level the mix, then bake for 12-15 mins until golden. Turn onto another sheet of paper, dusted with 1 tbsp caster sugar. Roll the paper up inside the sponge, then leave to cool completely. 2. Fold sugar, passion fruit pulp and one-third of the mango into the yogurt. Unroll the sponge, spread with filling, then roll up. Serve with the rest of the fruit on the side.